Claire Burnet from Groovy Native Permaculture is a proud local sponsor of the Bream Creek Farmers Market Cook Book and is a founding and active member of the BCFM Committee. Claire is passionate about sustainable living and supporting Tasmanian farmers and producers. Permaculture encompasses all of this – but what exactly is it? Permaculture offers a simpler way of life… with a do-it-yourself approach combining knowledge with the skills to become food productive, energy and resource efficient. Permaculture systems are consciously planned and combine landscape design with plants and animals to achieve a sustainable environment in urban or rural areas. Put simply, Permaculture is about putting things in the right place. Claire teaches Permaculture through practical workshops and designs landscapes and gardens using Permaculture principles. She offers individual designs to help you live sustainably, save money and rediscover your time and energy. The BCFM Committee warmly thanks Claire for her generous sponsorship of the Bream Creek Farmers Market Cook Book. We are so proud to have local, small businesses with a focus on sustainability involved with the Cook Book and the BCFM. 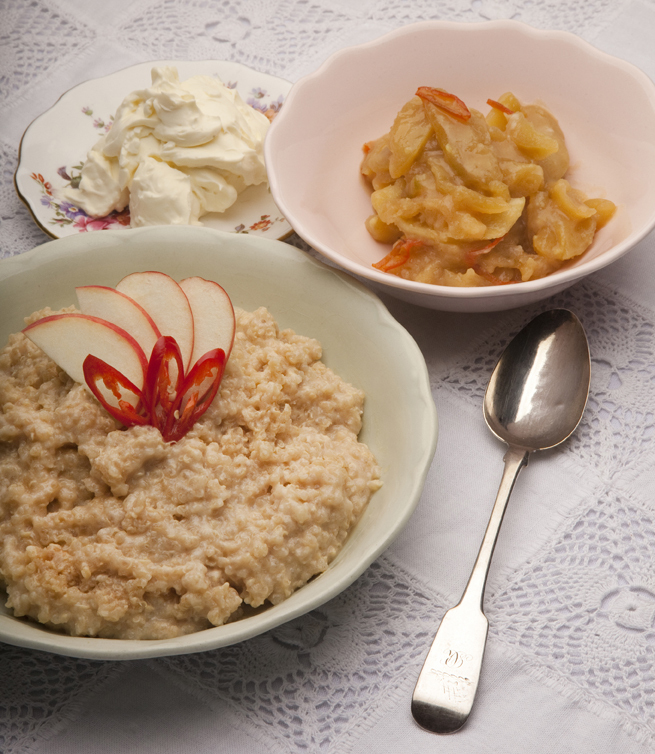 Read on for Claire’s lovely recipe for Creamy Quinoa Pudding with Caramelised Chilli Apples. Claire developed this recipe as an alternative to rice pudding when she and her children challenged themselves to eat only Tasmanian origin produce for 12 months. What an achievement, Claire! Quinoa is a complete protein, ‘pseudo-cereal’ originally grown in South America. Here in Tasmania it is grown by Kindred Organics and is not washed, heated or dried. The only food miles are from their farm to your plate. Place the quinoa in a bowl with 1 cup of the cold water. Leave it to soak for no longer than 10 minutes, then rub the grains thoroughly between your fingers until you make lots of soapy bubbles. This is the quinoa’s saponin, or protective bitter coating coming off, so it is important to rub well. Rinse & drain in a sieve. Add the washed quinoa and remaining cup of cold water to a saucepan. Bring to the boil and simmer, covered, for around 3 minutes, until the water is absorbed. Stir in the milk, honey and salt. Bring to the boil, then reduce the heat and simmer, uncovered, for around 20 minutes or until most of the milk has been absorbed. Stir occasionally and watch that the milk doesn’t boil over. Peel and core the apples. Slice into approximately 3mm thick slices and place in a saucepan with the cream, honey, chilli and salt. Simmer, stirring occasionally until the apples are cooked and the sauce has thickened. Serve the warm quinoa pudding in a bowl with the caramelised apples on top and a dollop of fresh cream. Freeze or dry your home-grown chillies in autumn for use during the winter months. When adding the chillies, the idea is to give the sauce a warm kick – but use less if you are serving the pudding to children or to those who are sensitive to chilli. Enter your email address to follow this blog and receive the latest 'Bream Creek Farmers Market' updates. It’s gonna be a hot one with a hot lineup to boot! Our last Summer Addition Market is on, Sun 20th Jan!